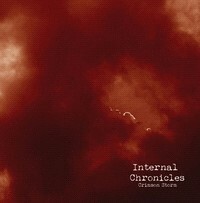 INTERNAL CHRONICLES is a one man black metal project from Zagreb, Croatia. NoOne is the artist name of the guy behind all of this. With the help of a computer he made a virtual band. The sound isn't flawless but in that genre it is not that important, almost all is permitted. Let's have a look at this. "A Beautiful Day to Die" is the first encounter with heated blacksmith's steel on our asses, as it delivers doomed black metal or blackened doom with reverb filled cavernous vocals.The structure of the song is doom related but the sound and atmosphere is more on the black metal side. Crimson Maiden begins with church like choirs. The guitar is slightly distorted, there is a melancholy atmosphere. A narrative voice asks questions and converse with a female. All is constructed with piano, violins, and a more growling voice, then multiple entwined ones. I really like the choice of using strings.This songs reminds me of Canadians WOODS OF YPRES. An excellent defunct one man project at first that became a band back then. "The Life's Cure is a more moving one. The drums are fast, and repetitive.It's a great song but in my opinion, the vocals should be more loud to prevent being stuck in the guitars. There is some curious effect on the vocals too, in between robotic and demoniac. The guitar section is more doomy. There are some cool keyboards and it adds a lot to the songs giving it more of an expansion feel, more space except for the last minute or so where i think it's too much. But the vocals idea is nice. "Crimson March" is a pretty dark intro where simplistic piano invites us to this march. Synths are added too after. Growing to an enormous and fabulous peak of energy it reaches the ending finale, ending where it started, like finishing the circle. "You Are" is the fifth track and it starts like a KATATONIA or AGALLOCH song (the guitar). It reminds of some old EVEREVE album called "Seasons". It's melancholy and angry, with a different riff genre and approach. "Deadly Silence" starts with an anthemic guitar line, then black metal vocals with growls that can be heard in the background. Very BATHORY like influences song to me. It has a sweeping guitar with repetitive melody in the background. Strings are used in the last minute to add a dramatic feel which it's cool. "Crimson Storm" is an hybrid: the first half of it is slow, cavernous nightmare-esque mix of razor sharp organs with vocals, pounding drums and riffs. Around 1 min 45, it changes to a more rhythmic passage.The mix is well balanced. A nice transition can be heard around minute three, with samples of winds and (waterfalls?). Then it gets more fast and furious till the reach of the end. It's an album that sounds like a demo…a fistful of great ideas put together. An overall enjoyable play, but sounded a little to synthetic in the end.